BEVERLY HILLS, CA, US, February 19, 2019 /EINPresswire.com/ -- February 2019—Beverly Hills2, CA. 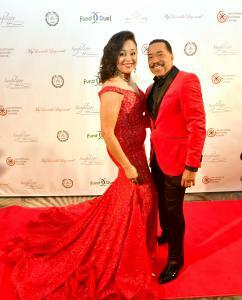 The Multicultural International Motion Picture Association (MIMPA), welcomed a star-studded line-up of entertainment and celebrity guest to its 10th Annual Lady in Red3 Diamond Rose Awards Gala. MIMPA held the annual affair this year at The Beverly Hilton Hotel, and the event was hosted by Emmy Award Winning Actor/Entertainer, Obba Babatunde, “Miss Evers Boys”, “Introducing Dorothy Dandridge”, “The Eye”, “The Notebook” , “John Q”, “After The Sunset”, “I’m Dying up Here”, “Half N Half”, “Life”, “The Temptations”, “Once In a Lifetime”, “Dear White People”, “The Bold & The Beautiful”, “CSI ”and “Dreamgirls” just to name a few of his many, many film, television and stage roles. Mr. Babatunde also performed with his band, “The Red Hot Four” at the event opening the show with his magnificent cover of Nat King Cole’s “Unforgettable”. In attendance at the invitation only awards gala were, legendary Actresses, Nichelle Nichols, “Star Trek” Beverly Todd, “Lean on Me”, “The Bucket List”, Sheila Frazier, “Shaft” Actors, Donnell Turner, “General Hospital” Rodney Allen Rippy, “Six Million Dollar Man”, “Jack in the Box”, Composer HB Barnum, Claudette Robinson, of “Smokey Robinson & The Miracles, former NFL Player with The New York Jets, Walter Briggs, Jr. and so many more. Also amongst the celebrity filled event, were Actress, Judy Pace who received MIMPA’s Trailblazer Award, Actress, Kathleen Bradley-Redd, receiving MIMPA’s Pioneer Award, and Motown Producer, Iris Gordy who received the, Legendary Producer Award. Other honorees included, internationally reknown Composer, Mirjana Anastasijevic who also gave the crowd an impromptu performance after receiving her award. Elisha Valentine took home the Education Award, while Lisa Sanfilippo received MIMPA’s Humanitarian Award. The Community Service Award went to Candidate for Supervisor of Los Angeles’ 2nd District, The Honorable, Jan Perry and the Entertainment Media Award was given to, Celebrity Journalist, Sharon Doyle. Lauryn Hunter received MIMPA’s Health Award, and Shelly Rufin, was honored with a Community Service Award. Jazz/Pop/Rock, Violinist, Lovely Previn aka Alicia Previn whose song stylings with her electric violin have toured the world with bands “In Tua Nua”, “The Young Dubliners”, and “The Hothouse Flowers”, performed at the event. Carmelita Pittman, who toured with the legendary James Brown, and is a renown Vocalist “Rosebud” recording, and Founder of The Rose Breast Cancer Society, was a featured guest artist, performing “La Vie En Rose” known as Lady in Red’s anthem, along with up and coming teen YouTube sensation, Gabriela Warren. “It was like a big giant Valentine Card, described one guest, a truly magical night”. “We were overwhelmed by the love in the room, and it was contagious”, stated Gail Gibson, President of MIMPA. “Our goal was to encourage, inspire and honor these 10 phenomenal women, while raising funds for the fight against homelessness”, said Gibson. MIMPA’s 10th Annual Lady in Red Gala was sponsored in part by The Sanfilippo Foundation, Acceptance Recovery, Theoria Technical College, Fundduel, Miss Jessie's Haircare and Myloveablelegs.com, to benefit Shelter Partnership, Inc. a 5013(c) that provides goods and services to the homeless of Los Angeles county. For more information The Multicultural International Motion Picture Association visit: www.mimpa.org, or contact gail@gibsonpublicrelations.com or visit www.gibsonpublicrelations.com Phone: (323) 799-6266.